clean, balanced, hydrated, and revitalized. 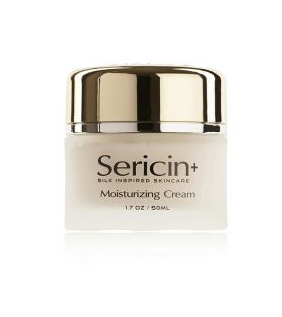 Richly luxurious, Sericin+ Moisturizing Cream is enriched with Silk Protein Sericin – known for its hydrating, moisturizing, and age-defying properties. 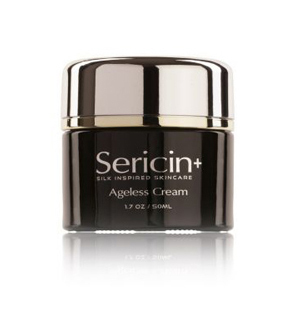 Sericin, a Silk Protein, is known for regulating and protecting skin’s natural moisture and hydration levels. 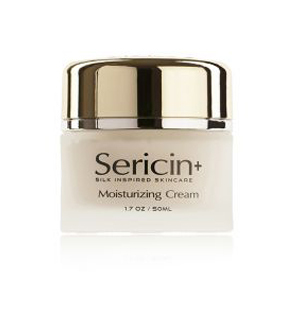 Sericin+ Moisturizing Cream absorbs quickly yet effectively, leaving your skin silky smooth, supple, hydrated, and radiant. It also works as an excellent primer for makeup. For all skin types. Directions: Apply to clean face and neck. Use daily both in the morning and before bed time as a Night Cream. Ingredients: Water, Cocos Nucifera (Coconut) Oil, Carthamus Tinctorius (Safflower) Seed Oil, Hydroxyethyl Acrylate/Sodium Acryloyldimethyl Taurate Copolymer, Sodium Hyaluronate, Prunus Yedosensis Leaf Extract, Butylene Glycol, Citrus Reticulata (Tangerine) Peel Extract, Hydrolyzed Silk, Squalane & Polysorbate 60, Polyacrylate 13, Polyisobutane, Polysorbate 20, Retinyl Palmitate, Benzyl Alcohol, Dehydroacetic Acid, Fragrance. Directions: Over clean damp skin, massage gently until desired exfoliation is achieved (usually 20-60 seconds). Rinse with warm water. Recommended to use 1-2 times a week. Ingredients: Water, Butylene Glycol, Carbomer, Sodium Hydroxide, Rosa Multiflora Fruit Extract, Enteromorpha Linza Extract, Laminaria Angustata Extract, Cucumus Sativus (Cucumber) Fruit Extract, Angelica Acutiloba Root Extract, Hydrolyzed Silk, Eribotrya Japonica Leaf Extract, Paeonia Suffruticosa Root Extract, Pueraria Lobata Root Extract, Aloe Barbadensis Leaf Extract, Phenoxyethanol, Ethelhexylglycerin, Fragrance. Directions: Stir Well. Massage over clean, damp face and neck. Experience a warming effect. Leave on for 5-10 minutes. Rinse off with warm water. Use as needed. Note: We recommend to apply this Thermal treatment every 2 weeks. After the Mask is removed follow with our Ageless Serum and Cream. The Serum & Cream regimen should be applied 2 times a week or as needed. Ingredients: Zeolite, Glycerin, Carthamus Tinctorius (Safflower) Seed Oil, Prunus Dulcis (Sweet almond) Oil, Glycine Soja (Soybean) Oil, Glycerin, Carthamus Tinctorius (Safflower) Seed Oil, Cocos Nucifera (Coconut) Oil, Helianthus Annuus (Sunflower) Seed Oil, Coco Caprylate/Caprate, Polyglycerol-3 Polyricinoleate, Polyglyceryl-3 diisostearate, Disteardimonium Hectorite, Glycerin, Kaolin, Hydrolyzed Silk, Ginkgo Biloba Extract, Rosa Multiflora Fruit Extract, Eribotrya Japonica Leaf Extract, Aloe Barbadensis Leaf Extract, Phoenoxyethanol & Caprylyl Glycol & Ethylhexyl Glycerin & Hexylene Glycol, Fragrance. 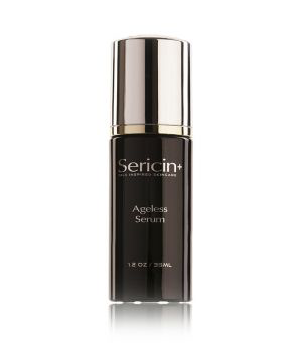 Sericin+ Age-Defying Serum is formulated to combat visible signs of premature aging such as lines and wrinkles. Enriched with Silk Protein Sericin – known for its hydrating, moisturizing, and age-defying properties, this serum is designed to improve skin firmness, texture, and elasticity while recharging and boosting the skin. This rich, silky serum penetrates deep into the skin to generate a revitalized, refreshed, and youthful appearance. 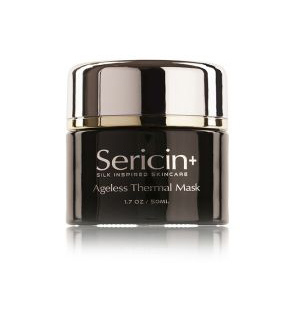 For best results, use with Sericin+ Age-Defying Cream & Thermal Mask. For all skin types. Directions: Gently tap onto clean skin. Use as needed. This Serum is a great delivery system for our Ageless Cream and therefore is recommended to be applied just before the Cream but is can also be applied by itself. Ingredients: Water, Butylene Glycol, Sorbitol, Panthenol, Paeonia Albiflora Root Extract, Ceratonia Silique (Carob) Fruit Extract, Sodium Hyaluronate, Hydrolyzed Silk, Carbomer, Sodium Hydroxide, Allantoin, Disodium EDTA, Phenoxyethanol, Ethelhexylglycerin, Fragrance. Directions: Apply to clean face and neck in circular motions. Use as needed. Recommended to apply at night time as it has a heavier texture than our Moisturizer. Ingredients: Water, Cocos Nucifera (Coconut) Oil, Carthamus Tinctorius (Safflower) Seed Oil, Hydroxyethyl Acrylate/Sodium Acryloyldimethyl Taurate Copolymer, Panthenol, Paeonia Albiflora Root Extract, Ceratonia Silique (Carob) Fruit Extract, Sodium Hyaluronate, Hydrolyzed Silk, Squalane & Polysorbate 60, Tocopherol, Polyacrylate 13, Polyisobutane, Polysorbate 20, Phenoxyethanol, Ethelhexylglycerin, Fragrance. Ingredients: Water, Butylene Glycol, Plunus Amygdalus Dulcis Extract, Panthenol, Ginkgo Biloba Extract, Rosa Multiflora Fruit Extract, Cucumus Sativus (Cucumber) Fruit Extract, Aloe Barbadensis Leaf Extract, Medicago Sative (Alfalfa) Seed Extract, Hydrolyzed Lupine Protein Carbomer, Sodium Hyaluronate, Hydrolyzed Silk, Hydrolyzed Candida Saitoana Extract Allantoin, Disodium EDTA, Phenoxyethanol, Sodium Hydroxide, Fragrance. 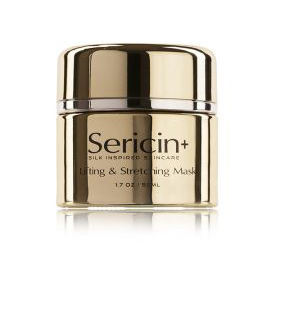 Sericin+ Lifting & Stretching Mask is enriched with Silk Protein Sericin – known for its hydrating, moisturizing, and age-defying and beautifying properties. Designed to stimulate cell renewal and provide an instant, noticeable lifting effect, thereby minimizing visible signs of premature aging such as lines and wrinkles, this mask, will tighten, lift, and stretch your skin for a supreme appearance. Short term results are smoother skin and a lifting effect. Long term results are improvements in skin firmness and elasticity and a more glowing, youthful look. For best results, use with Sericin+ Lifting & Stretching Serum & Cream. For all skin types. Directions: Apply generously over clean face and neck. Wait 5-10 minutes. Rinse off with warm water. Use as needed. Ingredients: Water, Kaolin, Magnesium Aluminum Silicate, Cellulose Gum, Glycerin, Carthamus Tinctorius (Safflower) Seed Oil, Panthenol, Glyceryl Oleate, Hydrolyzed Silk, Hydroxyethylacrylate/Sodium Acryloyldimethyltaurate Copolymer & Squalane & Polysorbate 60, Carbomer, Sodium Hydroxide, Caprylyl Glycol, Phenoxyethanol, Hedylene Glycol, Fragrance, Green 3, Yellow 5. 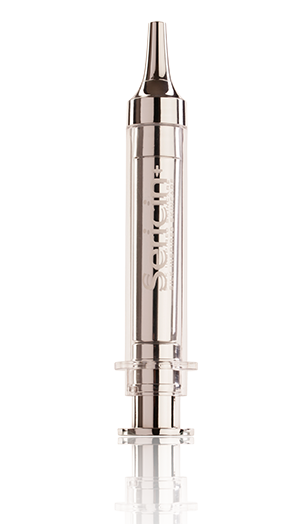 Sericin+ Intensive Eye-Lift Micro Cream, in an exclusive syringe for a controlled dosage over targeted areas, is based on a powerful, age-defying, formula to perfect and protect the delicate skin around the eyes while reducing visible signs of premature aging such as lines, wrinkles, under eye puffiness, and crow’s feet. This intensive cream, enriched with Silk Protein Sericin –known for its hydrating, moisturizing, and age-defying properties, is a very concentrated & potent formula of super peptides known for their effectiveness in lifting and tightening the skin very quickly, improving skin elasticity, reshaping the contours of the eye area, and reviving and rejuvenating the skin for a superior appearance. For all skin types. Directions: Shake well. Over clean, slightly damp face, tap a very small amount of cream over areas of concern, until fully absorbed. Do Not Rub. Stay motion-less for 2-5 minutes until dry. You will feel your skin stretching. A white layer indicates you have over applied and to be removed with a slightly wet cotton ball. Re-apply syringe cap between applications. To perfect results follow with our Reviving Eye Serum. Ingredients: Purified Water, Sodium Silicate, Magnesium Aluminum Silicate, Euterpe Oleracea (Acai) Fruit Extract, Perilla Frutescens Extract, Quercus Alba Bark Extract, Propane-1,2-diol, Chondrus Crispus (Seaweed) Extract, Hyaluronic Acid, Acetyl Hexapeptide-8, Pentapeptide-18, Dipeptide Diaminobutyroyl Benzylamide Diacetate, Acetyl Octapeptide-3, Palmitoyl Tripeptide-1, Palmitoyl Tetrapeptide-7, Cellulose Gum, Hydrolyzed Silk, Phenoxyethanol, Ethylhexylglycerin. 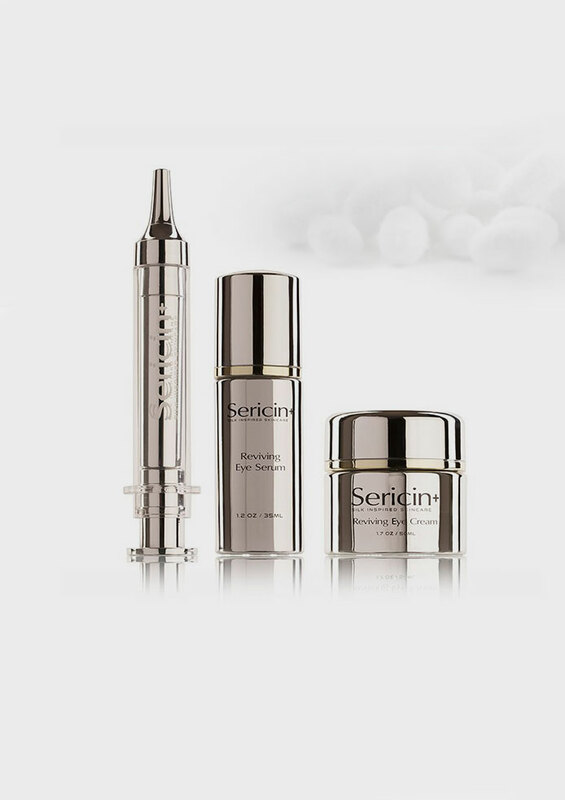 Sericin+ Eye Cream is based on a powerful, age-defying, formula to hydrate, correct, and protect the delicate skin around the eyes while reducing visible signs of premature aging such as lines, wrinkles, under eye puffiness, and crow’s feet. This Eye Cream enriched with Silk Protein Sericin – known for its hydrating, moisturizing, and age-defying properties – is designed to work in tandem with our Eye Serum to seal in moisture and improve skin’s firmness, texture, and elasticity. 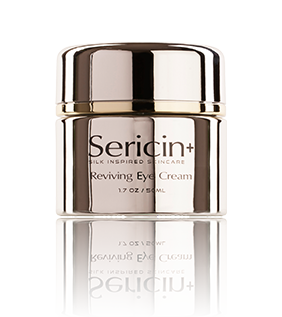 For best results, apply on top of Sericin+ Eye Serum. For all skin types. Directions: Apply in gentle circular movements onto clean skin around the eyes. Use as needed. Ingredients: Water, Carthamus Tinctorius (Safflower) Seed Oil, Cocos Nucifera (Coconut) Oil, Dimethicone, Dimethicone Crosspolymer, Hydroxyethyl Acrylate/Sodium Acryloyldimethyl Taurate Copolymer, Sodium Hyaluronate, Vaccinium Myrtillus Leaf Extract, Geranium Robertianum Extract, Hydrolyzed Silk, Polyacrylate 13, Polyisobutane, Polysorbate 20, Benzyl Alcohol, Dehydroacetic Acid, Beta-Carotene, Fragrance. 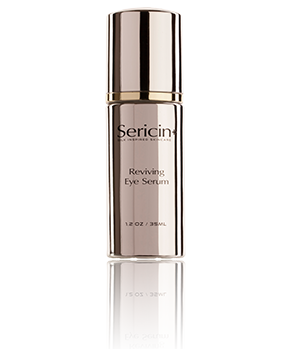 Sericin+ Eye Serum is a rich, silky formula developed specifically to deliver immediate, visible results to the delicate skin around the eyes. 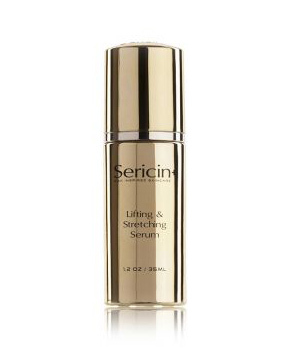 Enriched with Silk Protein Sericin – known for its hydrating, moisturizing, and age-defying properties – this Eye Serum penetrates deep to improve skin’s condition from the inside out while reducing visible signs of premature aging such as lines, wrinkles, under eye puffiness, and crow’s feet. Sericin+ Eye Serum is designed to work in tandem with our Eye Cream to seal in moisture and improve skin’s firmness, texture, and elasticity. For best results, follow with Sericin+ Eye Cream. For all skin types. Directions: Gently tap onto clean skin around the eyes. Use as needed. Ingredients: Water, Butylene Glycol, Sorbitol, Panthenol, Aloe Barbadensis Juice, Cucumus Sativus (Cucumber) Fruit Extract, Angelica Acutiloba Root Extract, Hydrolyzed Silk, Sodium Hyaluronate, Carbomer, Allantoin, Disodium EDTA, Phenoxyethanol, Sodium Hydroxide, Fragrance.